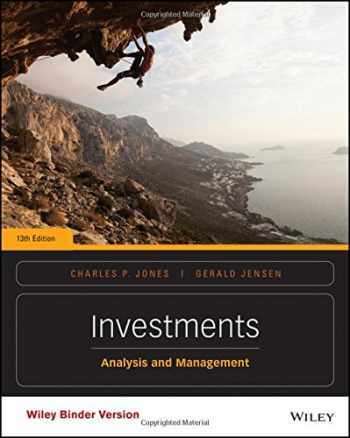 Acknowledged author Charles P. Jones wrote Investments, Binder Ready Version: Analysis and Management comprising 640 pages back in 2016. Textbook and etextbook are published under ISBN 1118975588 and 9781118975589. Since then Investments, Binder Ready Version: Analysis and Management textbook received total rating of 3.5 stars and was available to sell back to BooksRun online for the top buyback price of $76.09 or rent at the marketplace. This text is an unbound, three hole punched version.In an every-changing financial market, Charles Jones and Gerald Jensens' Investments remains one of the most readable and comprehensive investments texts. Students can count on the new 13th Edition for clarity, currency, and balance. An effective organizational structure and essentials approach, important analytical methods, and finance concepts are presented at a level that individuals of all investments backgrounds can master.